Shogi perfecto has met with enthusiastic reception all over the world since its release in 2016. I am so excited to announce the release of its younger, but bigger brother today: the shogi perfecto “zen” (禅) set. Now the first one has been named shogi perfecto “iki” (粋), and these two brothers complete the shogi perfecto lineup. Chess and Shogi variants have long been played and loved all over the world, and have brought innovations such as (1.) pieces that have their own roles, (2.) boards with checkered patterns, and (3.) redeployment of captured enemy pieces as your own to the history of board games. On the other hand, all these classic games have designs and motifs*1 that seem independent from the rules; that is to say that the figurative or ideographic pieces offer little to no hint as to how they move. Shogi perfecto has been developed in honor of these great innovations, but using more modern functional design practices to embed the rules into the components, with each piece’s design suggestive of how the piece moves. This “perfect” representation artistically communicates not only the movement of the pieces, while retaining the crucial directionality that indicates the army for which the piece currently fights, but also proclaims that shogi is one of the great abstract strategy games from Néstor and The Museum of Abstract Strategy Games. Shogi perfecto is now on sale at nestorgames. shogi perfecto “iki” is delicately designed strongly respecting authentic shogi. An amazingly stylish marriage of Edo culture and Spanish ambience. Bold and bulky pieces are made a little more round. 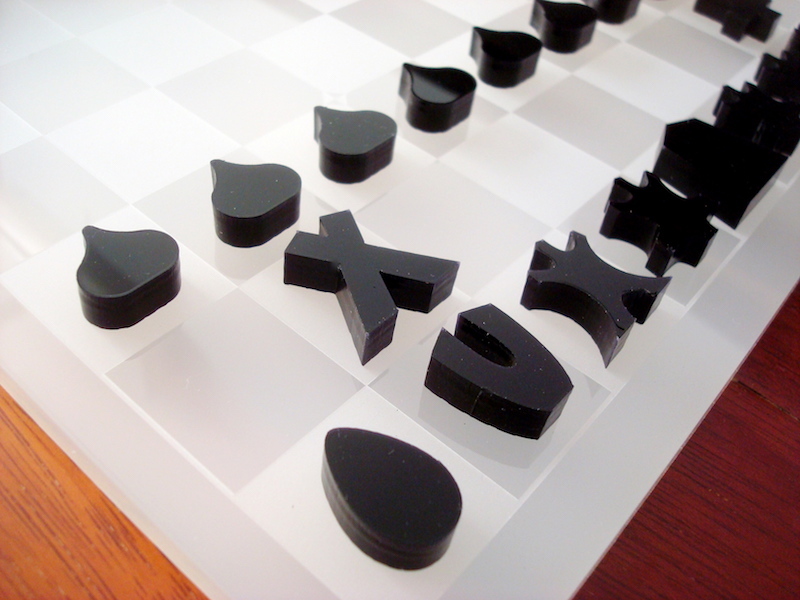 Unlike original Japanese shogi boards, its board has been designed with no margin. The set is named “zen” (禅), aiming for a harmony with Chess that has been long and widely played in the world. Ensō (円相) is applied to its logo. To the promoted pieces of iki, a geometric design commonly represent Spanish-Islamic and Edo design *2 is applied. It is just a simple combination of equilateral triangles, but immutable and infinite beauty lies there. For the promoted little pieces of zen, we designed a beautiful pattern using the shape of Gold general. It looks like ”fleur-de-lis,” very popular armorial bearing with lilies. To big pieces, a splashed patterns with “※”, that are often used for Japanese kimono fabrics, are applied, to show the moves of the pieces. See below the pieces of “iki” and “zen”: You can see how different they are in sizes, shapes and patterns.